Need help identifying Dodge HD Truck and Engine - Moparchat - Home of MOPAR enthusiasts worldwide! Hi everyone, this is my first post on this site. 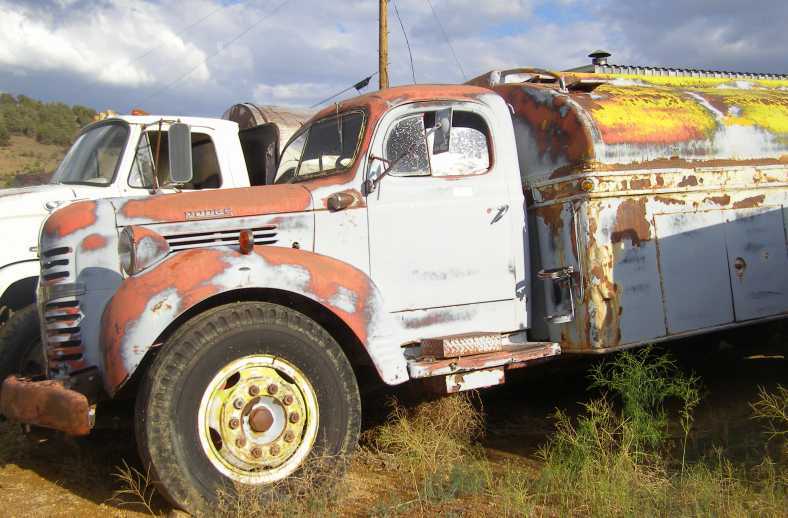 I am posting some pictures of an old HD Dodge Truck, with what I believe is a 413 C.I. Flathead Six. The flat on the block does not contain ANY of the letters/numbers that I have found anywhere on the net with regard to the "T" designations. There is no registration or serial number plate. Any ideas? Thanks. From what I can find, you are correct. It's a 413. Overall length Dampener to trans 48"
Bell housing to timing cove surface 33 3/4"
Pan sump to top of carbs 34"
That's a beast. I've never found one of those around here, which surprises me because you would think a few would have found there way into farm country, but I guess the farms and trucks around here was smaller in the day. What are your plans for it? 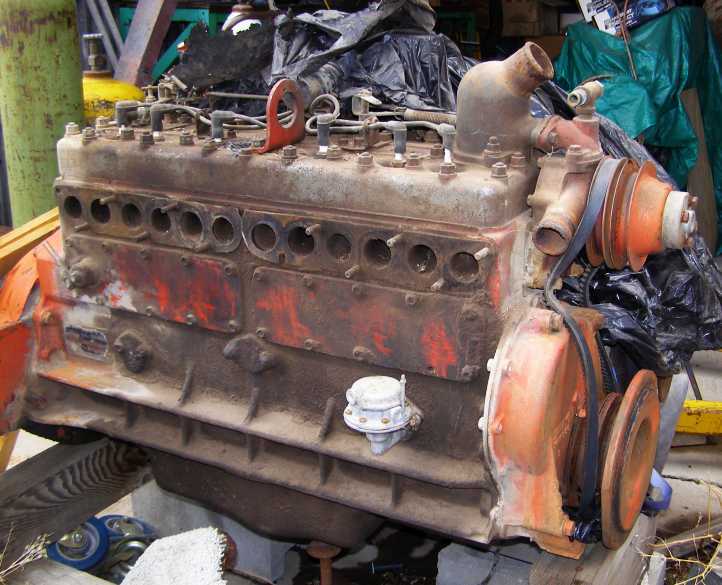 Yep, 281 and a 306 school bus engine were also 30 inch flatheads with 12 ports. The 281 was normally a "T136" designation, 1946-47, in WJ 55-59 vehicles. 331 was a "T135" in 46-47 WK 65-69 and WR 65-69 vehicles. Info on the 281 and 331 comes from "T Flathead Six Engines" on the net. 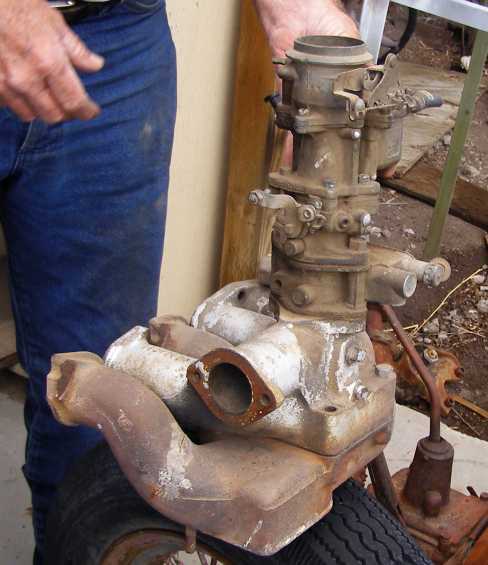 The info about the 306 comes from a guy who got at me on ebay who should be an administrator on a Dodge Flathead site. He knows his stuff. I have seen a couple of trucks with these engines, and Tom (posting on 'inliners.org') has one at his home in northern Nevada. Hi! This is my first post on this board. My understanding of the 413 flathead six is that it was only used in Dodge trucks for 1 year, 1954. They were a force to be reckoned with from what I've been told. My Grandfather owned one and, believe it or not, other truck drivers would come to my Grandfather and offer to run loads for free to get a chance to drive it. Nothing slowed it down, full load, hills, nothing. It was the only one in the area. Another man would borrow it from time to time if his truck was down for any reason. Even he said it was the fastest thing on the road. . The grillwork on the fenders was supposed to signify it was a 413, 6 cyl. Here is a pic if it when it was new, hope it comes through. It was sold to a company around 1960 that hauled mail. The truck, at that time, had around 200,000 miles on it.